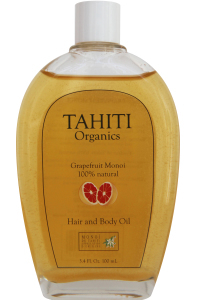 Tahiti Organics Grapefruit Monoi oil is a natural cosmetic product made in Tahiti. This product is mainly used as a personal care product (hair softener or skin repairing) or an organic massage oil. Tahiti Organics 2013 - 2015. All Rights Reserved.